You would think with the Eurozone crisis adding to Italy’s woes (or vice versa), many italians would be looking to their stars for signs of financial fortune. 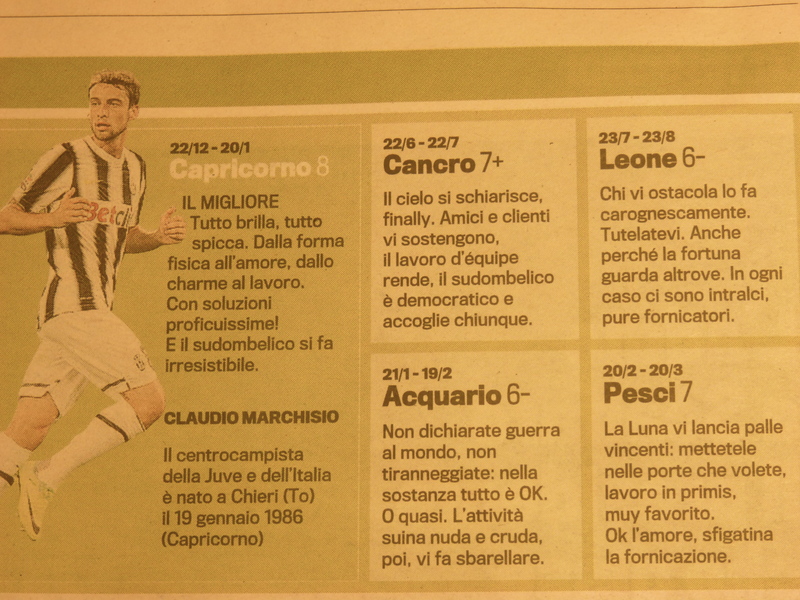 But, it seems, this is not the case for the average italian man according to La Gazzetta dello Sport, the iconic pink sports newspaper that boasts 3 million readers daily, and with whom I am constantly in competition with for R’s attention. I usually cry inside every time I see us taking a detour to buy it from the newspaper stand, knowing that as soon as he opens it, I’ve lost him for a good two hours. 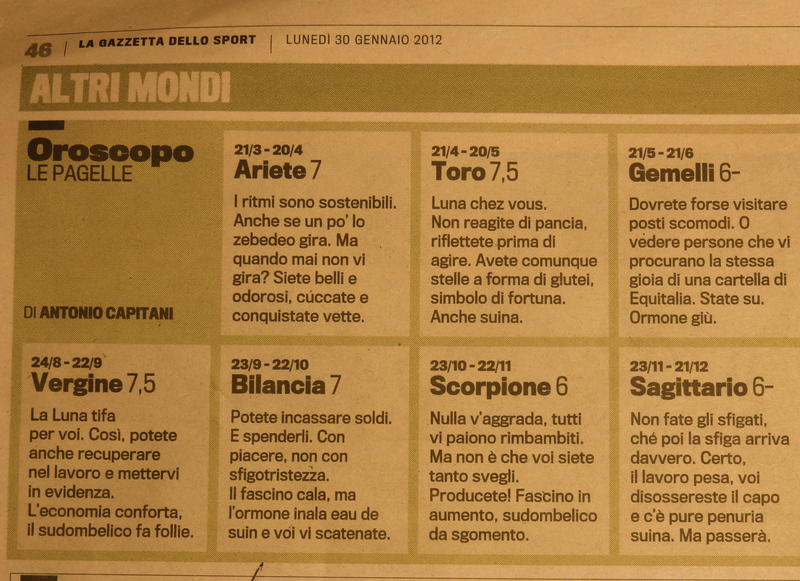 Until I discovered the horoscope section which I caught R reading?!? (on more than one occasion might I add). I could not believe it when he translated it for me and it made me laugh so much I had to share it. Apparently, it’s taken very seriously and boasts many followers across the country. VIRGO: The economy is comforting. Below the bellybutton goes crazy. ARIES: You are beautiful and perfumed, you flirt and reach new heights. LIBRA: The intrigue lowers but the hormone inhales perfume of piggy (swine) and you go crazy. AQUARIUS: Naked and crude piggy activity makes you go crazy. CAPRICORN: Below the bellybutton becomes irresistible. PISCES: Ok in love, unlucky in fornication. 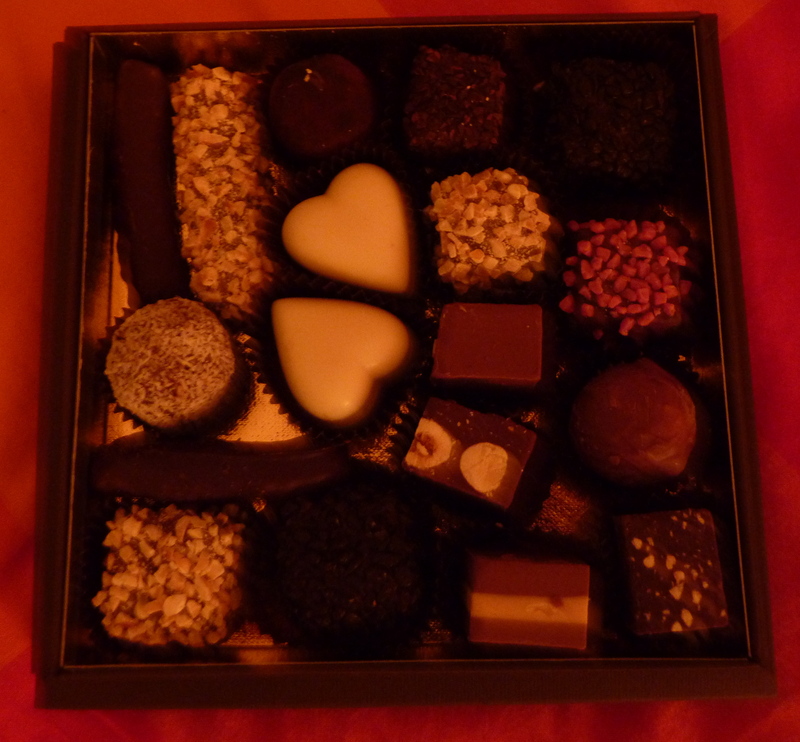 Gourmet italian chocolates from Venchi- famous for their crushed, caramelized hazelnuts coated in dark chocolate. A very sweet welcome gift- and something everyone should try when in Italy. 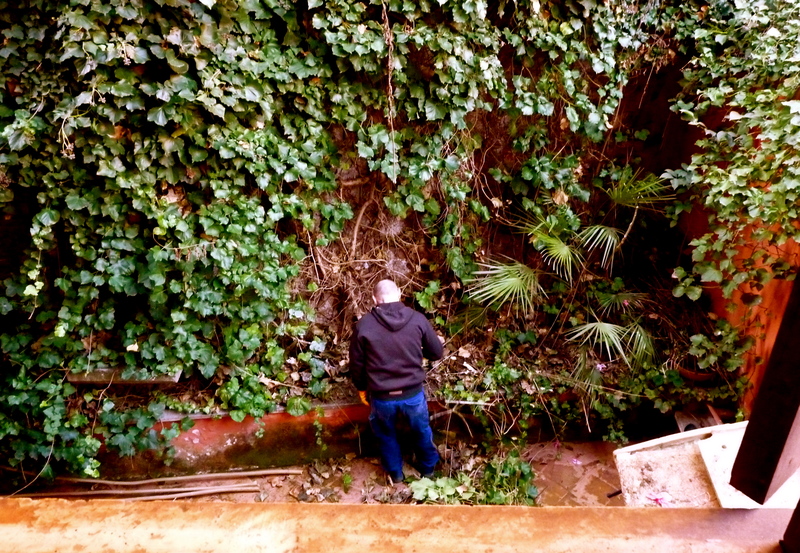 Vittorio, the handyman, getting the garden ready for spring. The transformation took him an hour! And we discovered we have a bird bath. 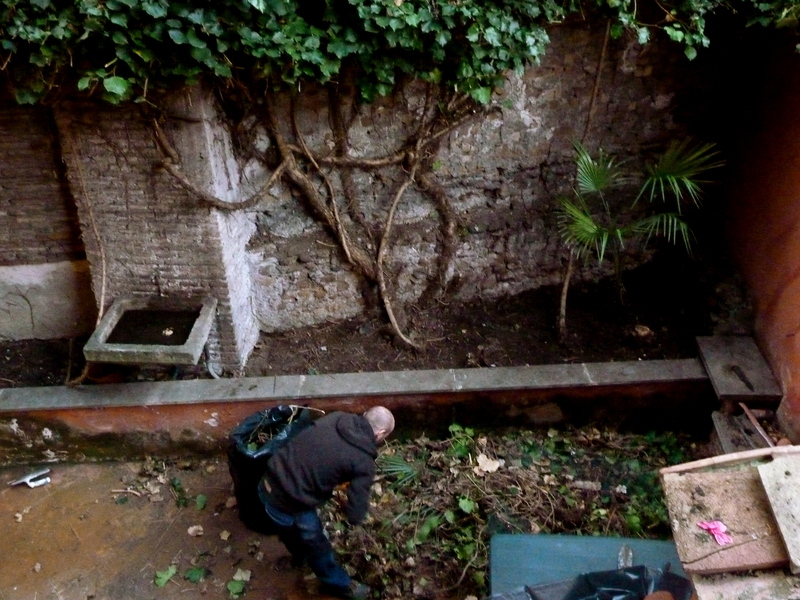 Any recommendations on what we should plant here? 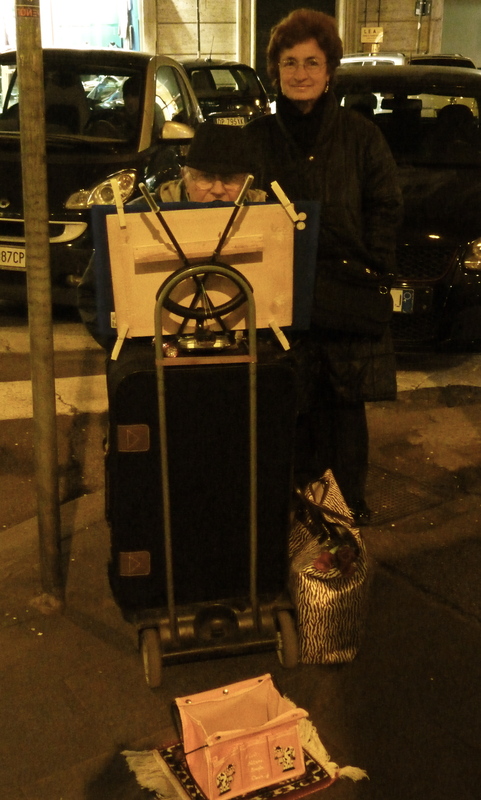 The old karaoke singer and his wife who frequent Via Del Corso every evening. He sings away to a pre recorded track for change while she stands and looks on lovingly. 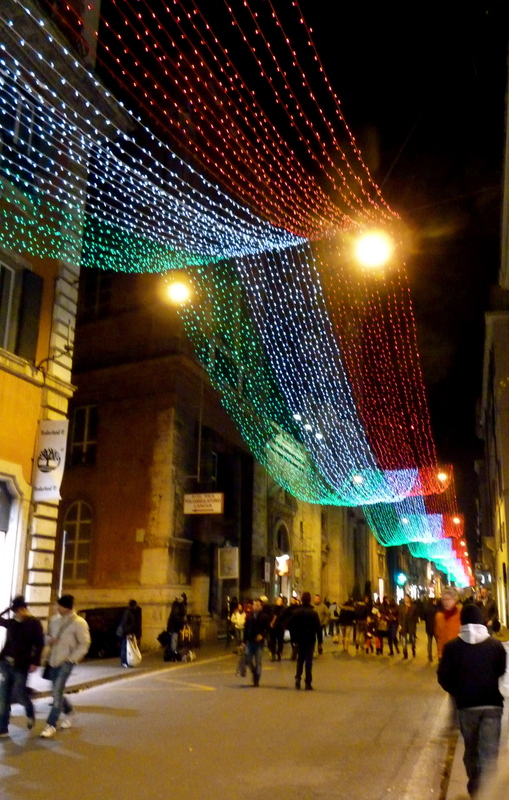 The lights running down Via Del Corso marking Italy’s 150 years of Unification- and still making it feel Christmassy. I can happily say my life fits into 4 suitcases. Well, not my life, my belongings. I know this because I have just moved from London to Rome- for love. R and I have been together for 4 and a half years ( 4.4yrs have been long distance) and I decided to take the plunge (my story will unfold later). We met in London, where he was at film school and I was studying journalism. He moved back to Milan for work and I got a job as a producer at a 24 hour news channel in London. What followed was an awful lot of airtime, skype sessions, foreign cities, lonely nights and questions-on-the-meaning-of-life-and-existance, until I made a decision to leave the city I wasn’t so in love with, for 365 days in the city I am in love with. And that’s why I’ve started this blog. To document my progress…if any :). To show you Italy on the back of an italian’s Vespa. 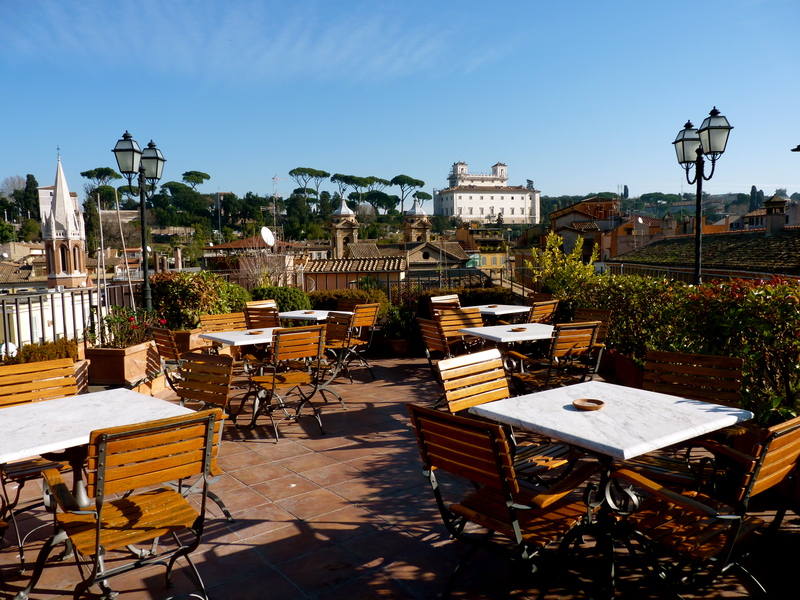 So you can fall in love with Rome (even from a distance).